I try my best to adhere to a Paleolithic way of eating. Simply put; Eat Real Food. No grains or processed foods. Since being diagnosed with Lupus in 2010 I have tried every modified diet under the sun. I can’t say that my diet has taken all my symptoms away but I am certain I would feel much worse if I wasn’t mindful of what I put in my body. Listening and becoming attuned to our bodies is so important. Some foods that agree with other people’s bodies may not agree with yours. So listen and be willing to makes changes as you go. Now on to this awesome recipe! 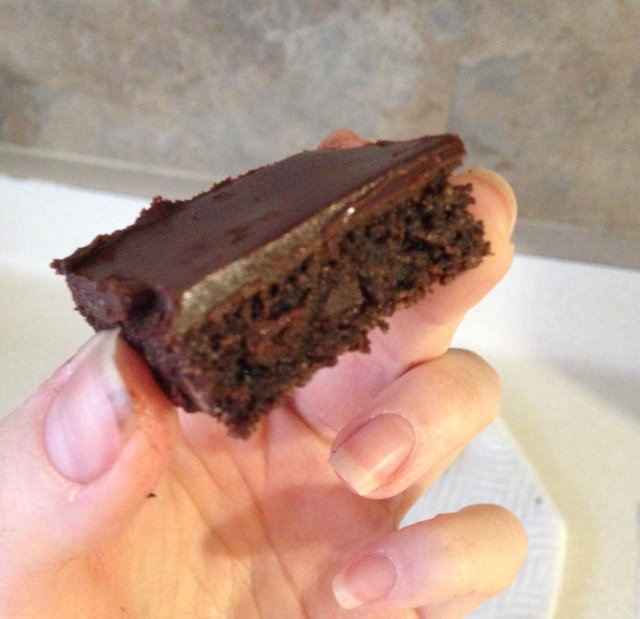 These brownies are adapted from a totally amazing blog called The Paleo Partridge. Martine Partridge is incredibly gifted at coming up with some of the best Paleo, AIP (autoimmune protocol) recipes around! She is a Crohn’s fighter herself so she really knows how important it is to have good recipes on hand that don’t cause our bodies inflamation. Preheat oven to 350 degrees. Lightly grease an 8×8 baking dish. In a bowl sift dry ingredients; coconut flour, arrowroot flour, cocoa powder, baking soda, salt, and cinnamon. In a separate bown with a mixer, combine the apple sauce, oil, honey, apple cider vinegar, and vanilla. In saucepan add gelatin to ¼ c water and let it desolve. Turn the heat to medium low to melt the gelatin. Wish quickly until the gelatin egg is frothy. Then combine this to the brownie mixture until fully incorporate. Add chocolate chips. Pour the mixture into greased baking pan and use rubber spatulas to even out mixture. Bake for 25 minutes. Remove from the oven and allow to cool for 15-20 minutes before cutting. While the brownies are cooking prepare frosting. Melt chocolate in a small sauce pan on low with coconut oil, coconut butter, almond butter, cashew butter, (or use double boiler method). After everything is melted add maple syrup or honey and splash vanilla. Pour evenly over brownies and let cool or chill in refrigerator. Cut into squares and enjoy! *You can replace the gelatin egg with a real egg. This works fine as well! If you do use a real egg, you can omit the vinegar in the recipe. The pictures I have really don’t do this yummy dessert justice, but here they are none the less. 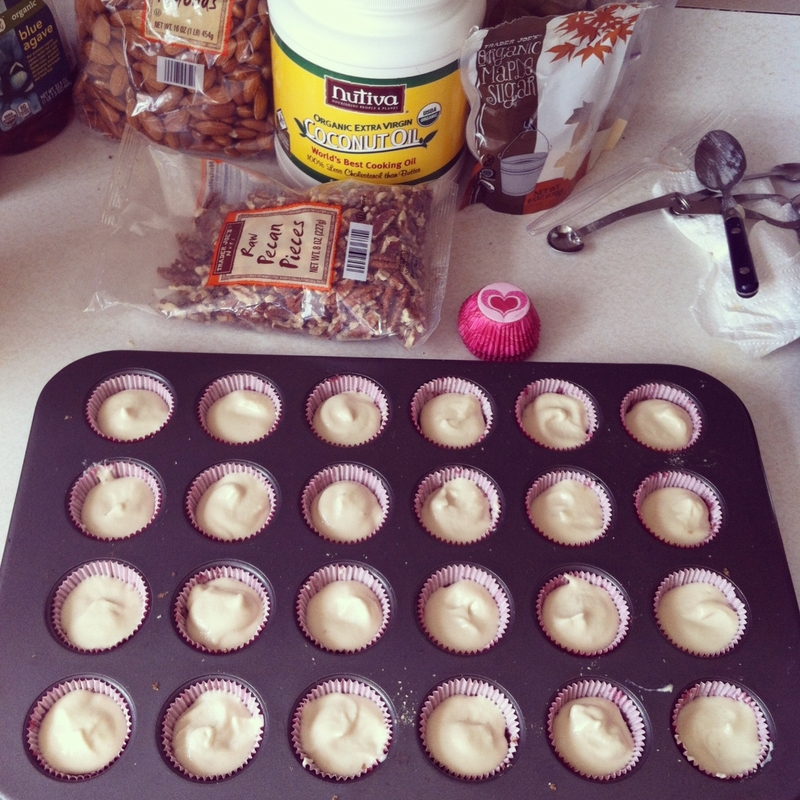 I make the cheesecakes in mini cupcake pans because they’re pretty rich, being that they are made up of mostly nuts. Plus it makes it much easier to share! The recipe makes about 35 mini cheesecakes bites. 5-6 whole dates soaked in warm water for about 30 minutes (if using majooled dates you don’t have to soak them and you might need only 3-4. 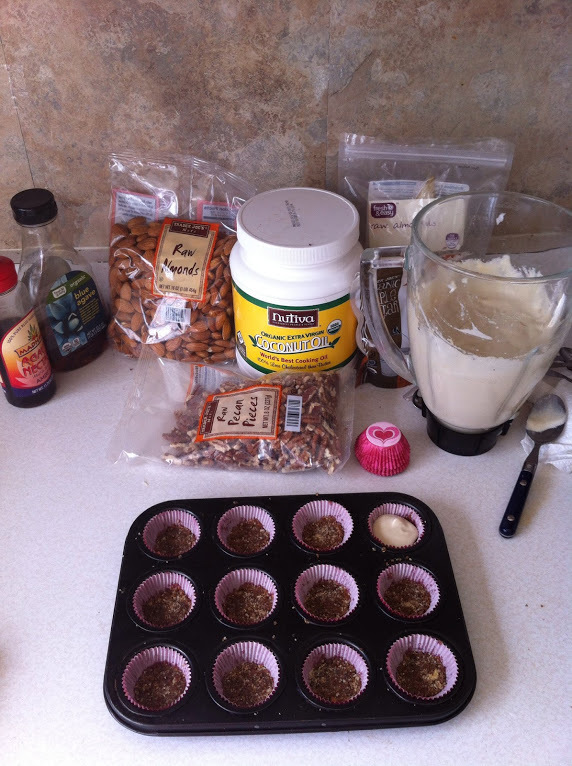 Step 1: Grind nuts, dates, cinnamon, and honey in food processor, heavy duty blender, or vita-prep. Grind up until mixture has a crumbly texture, sort of like a gram cracker crust. Using a spoon divide mixture into lined mini cupcake pan; pressing down crust into bottom of each one. I use a caugh syrup bottle to do this. I know it sounds unconventional but the top fits perfectly into the mini cupcake pan. I’m sure there are other kitchen tools that will do the job too! 🙂 After crusts is pressed down cover with foil or wax paper and chill in freezer while you prepare the cheesecake mixture. Step 2: Drain your cashews that have been soaked overnight. Put cashews, coconut oil, lemon juice, agave, vanilla, salt, and water into blender or food processor. Blend for about 1-2 minutes until completely smooth. At this point it is a good idea to taste the mixture making sure it has that cheesecakey flavor. sometimes just a touch more lemon juice can make all the difference in the world. Once blended, pull out your crusts from freezer and pour mixture into each tin. Filling up about 3/4 of the way, leaving room for fruit topping. Cover again and place back into freezer while you prepare your topping. Since this is a raw recipe I don’t cook the berries but if you are not adhering to a strict raw diet, feel free to use cooked berries if you so desire. I like using Trader Joe’s brand frozen fruit to make my toppings, but you could use any fruit mixture you enjoy. 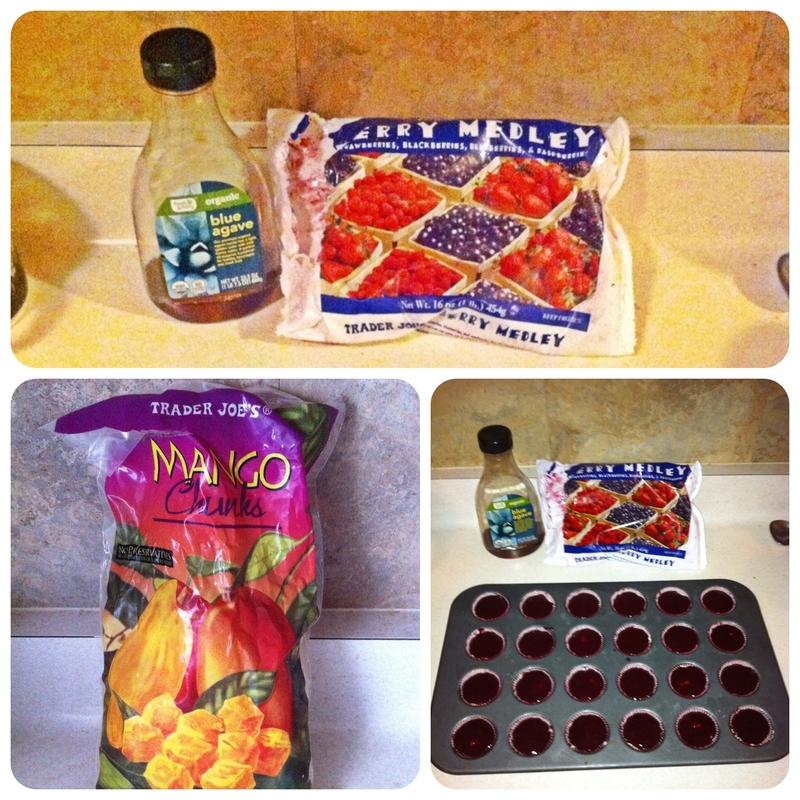 My favorites are organic frozen mixed berries and the frozen mango. I usually use two different kinds of toppings just because I can never decide which one I like better. they are both so good. Plus if you are sharing them it’s nice to offer a couple different choices. I have to say the mango is amazing, definitely a must try! Step 4: Place frozen fruit in strainer and run warm water over until somewhat thawed. Or you can place fruit in warm water for 5 minutes or so. Put fruit in blender or food processor and about a 1/4 cup of honey ( you can use more according to your taste). lastly, I like to add one tablespoon lemon juice or lime juice to fruit mixture. I find the lime with the mango topping is absolutely amazing! When using berries I usually strain them through a strainer to get rid of the pesky seeds. That is of course up to you. Now that your topping is made, pull your cheesecaes out of freezer. Gently spoon topping onto eah cheesecake filling to the top of tin. Cover again and plave back in freezer. They will stet in about 30 minutes. Once ready to serve pull out of freezer and take each one out of the cupcake pan. Allow them to sit at room temperature for about 5-10 minutes before serving. These little guys really are a labor of love but so worth it in the end!! Hope you enjoy!